Yesterday, the UN General Assembly voted on a resolution , proposed by Ukraine and backed by the United States and European Union, to affirm its commitment to Ukraine’s internationally-recognised borders and to dismiss the Crimean referendum as ‘having no validity’. One hundred states voted in favour (including Australia), 11 against and 58 abstained (results here ). Unsurprisingly, Russia—which was not named in the resolution—voted ‘no’. The Carnegie Endowment for International Peace asked an expert panel ‘what are the global implications of the Ukraine crisis? ‘ The panellists, Eugene Rumer, Andrew S. Weiss, Ulrich Speck, Lina Khatib, George Perkovich and Douglas H. Paal also answered other questions on the impact of the situation on US strategy, China , Syria and global strategic affairs. Turning to the implications for our region, Brad Glosserman of Pacific Forum CSIS has a National Interest piece on why Crimea matters to the US and Asia . He argues there are more subtle lessons to learn; he asserts that realism remains a feature of foreign policy and is characterised by ‘more subtle uses of force: scalpels, not cleavers’. Keep reading here . Similarly, Sean Kay argues on War on The Rocks that Russia’s actions prove the case for the US pivot to Asia . He says the US should ask its NATO allies to do more while it carries on ‘with a calibrated and careful pivot to Asia which remains America’s most important strategic priority’. Read more here . CNAS held a Google Hangout this week, bringing together experts on three continents to discuss maritime security in Asia through the prism of US alliances. Speakers included Admiral Gary Roughead, Dr Patrick M. Cronin, Commander Paul Giarra, Former Minister of Defense of Japan Satoshi Morimoto, the Lowy Institute’s Rory Medcalf and CNAS President Richard Fontaine. You can watch the video of the event here . The CNAS event follows the publication of a new multi-authored report ‘Tailored coercion: competition and risk in maritime Asia’  which explores questions on how to ‘encourage China to move toward compromise and cooperation in the maritime domain, as well as how to respond should Beijing choose to follow a different path’. Sticking with maritime security, US PACOM commander Admiral Samuel Locklear stated that China would likely have submarines equipped with long-range nuclear missiles . Speaking before a Senate Armed Services Committee earlier this week, the Admiral was referring to China’s JIN-class nuclear powered ballistic missile submarine and the new JL-2 missile on board the vessel. If you’re interested in submarine matters, head down to ASPI’s International Submarine Conference , 8–10 April. But hurry, registration closes next Thursday 3 April. More information, including the speaker line-up and program, is available here . You can also follow updates and live-tweets on the day via Twitter hashtag #SubCon14 . Lastly, if you haven’t read The Good Soldiers  (2009) by Pulitzer prize winner David Finkel, I recommend it. 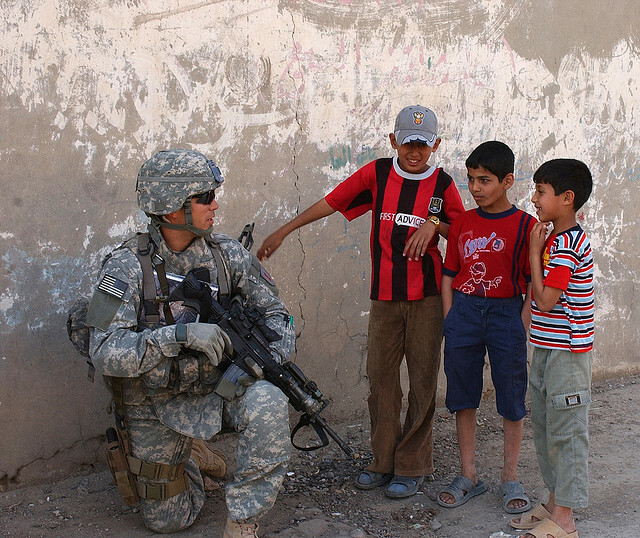 The book describes Finkel’s time embedded with US Army infantry soldiers known as the ‘2-16 Rangers’ (one pictured above), during the 2007 troop surge in Iraq. Finkel provides a raw account of ‘good soldiers’, everyday men and women who have been thrust into life-changing experiences and explores the ground-level effects of political decisions concerning modern combat. Journalist Martha Raddatz also has this interview  with Finkel on his new book Thank  Y ou  for Your Service  (2013) in which he follows the lives of 2-16 soldiers back home, chronicling their recoveries as well as the experiences of their families. Natalie Sambhi is an analyst at ASPI and editor of The Strategist. Image courtesy of Flickr user The US Army .